Aqua/Water/Eau, Ethylhexyl Methoxycinnamate, Octocrylene, Butyl Methoxydibenzoylmethane, Hydrogenated Polydecene, Caprylic/ Capric Triglyceride, Cetearyl Alcohol, Distarch Phosphate, Glyceryl Stearate Citrate, Prunus Amygdalus Dulcis (Sweet Almond) Oil, Glycerin, Butylene Glycol, Butyrospermum Parkii (Shea Butter), Dicaprylyl Carbonate, Acrylates/ C10-30 Alkyl Acrylate Crosspolymer, Alcohol Denat, Alpha-Isomethyl Ionone, Ammonium Acryloyldimethyltaurate/ Vp Copolymer, Benzyl Alcohol, Caprylyl Glycol, Citronellol, Coumarin, Glyceryl Caprylate, Glyceryl Stearate, Helianthus Annuus (SunOwer) Seed Oil, Hexyl Cinnamal, Limonene, Panthenol, Parfum (Fragrance), Phenoxyethanol, Salicylic Acid, Sodium Ascorbyl Phosphate, Sodium Dehydroacetate, Sodium Hydroxide, Sorbic Acid, Tetrahydrodiferuloylmethane, Tetrasodium Glutamate Diacetate, Tocopherol, Tocopheryl Acetate. 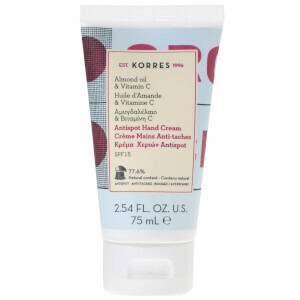 We recently discovered Korres and have found their products to be excellent ! This hand cream soaks in leaving hands hydrated and not greasy at all. Love it !! !